Chinese New Year commences on Saturday 28th Jan 2017, bringing in the year of the Rooster and saying goodbye to the year of the Monkey. Those born in 1921, 1933, 1945, 1957, 1969, 1981, 1993, 2005 and 2017 were born in Rooster years. Those born in 1957 & 2017 are Fire Roosters, and those yet to be born that arrive in 2029 will also be Roosters. 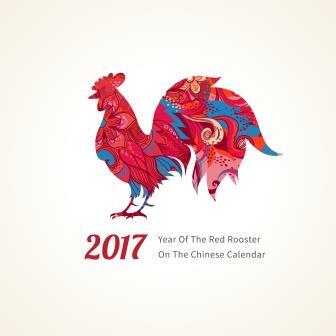 The rooster is the tenth sign in the Chinese zodiac and is also the most motivated of the signs. Roosters are courageous, resourceful and hard-working, they like to use their own initiative, they are multi-talented and so many career options are open to them and as such their job plays a very important part of their lives. Fire Roosters are even more responsible at work; they pay important attention to timekeeping and are extremely trustworthy. If you imagine a rooster in life – strutting its stuff, pruning as it goes – then that is to some extent how those born in the year of the Rooster behave, they have a tendency towards being vain and are not afraid to talk about their achievements. They expect others to pay attention when they talk and are very happy with the spotlight on them at social occasions. They are incredibly loyal to their friends; they are open, honest, chatty and amusing. Typically Roosters enjoy outdoor pursuits and will be active and healthy. They can be moody and stressed at times, but they recover and bounce back quickly. The best matches for Roosters are Ox or Snake. The worst matches for Roosters are Rat, Rabbit, Horse, Dog or another Rooster. Tigers and Dragons could be complementary, so it may work. Goats, Monkeys and Pigs are average matches, again it could work – but would probably take a lot of work and you may be better off as friends. If press reports are to believed then Meghan Markle and Prince Harry are dating. Many will have known her first for her role in the television show ‘Suits’. Meghan was born in August 1981 and as such is a Rooster. Prince Harry was born in September 1984 making him a Rat in terms of the Chinese zodiac. Unfortunately the Rooster and Rat are one of the worst Chinese animal sign matches – but only time will tell!